Instead of giving the password away on the newsletter, I will start giving it away on the Facebook page. I went with my girlfriend to the Venetian and we tried the Gondola ride, but I don't think it's worth what it costs. On the first day I was quite tired at the end of 4 hours and I didn't play much after that. The table was accessible and I was left with 6.000 chips (we start with 30.000). After that I reached 100k and I finished the day with 70k. 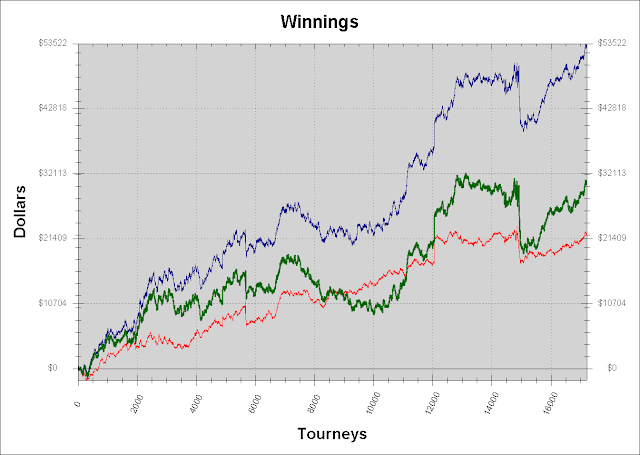 On the second day, I started at a more complicated table, where I only won one pot after 30 or 40 hands. After that, they changed my table and the new one was more pleasant. There were many passive players pre-flop and after a certain point they all avoided playing pots with me, which made it easier to accumulate chips. I only ate salads and fruit at the breaks. I don't know if it was because of the food or if I'm starting to get in a routine, but I managed to play concentrated through all of the day. Maybe when I go back to grinding I will have to eat light meals! I finished the day with 107k chips. Today day 3 is starting with the blinds at 500-1000 and antes at 100. The structure is very good and it allows you to play quite a lot. The plan is to play tight and study the table, but when a spot appears where I'm sure that a loose play is good, I'll do it. I'm staying at Palms Place, in a room offered by PokerStars as part of the deal for the SNE. The room and the hotel are fantastic! I spent some hours at the swimming pool where it was great to read while enjoying the sun. Unfortunately, here it's even hotter than in Athens and more dry too, so there was a day where I spent more money on water than what I spent on food (one bottle of water costs $1.5-3 in the street). The passwords for the tournaments of the blog are exclusively sent to followers through the blog's newsletter. You can find how to subscribe to the newsletter in the FAQs. I hadn't been playing much since I finished the challenge, because I was tired. I only played some mtts... 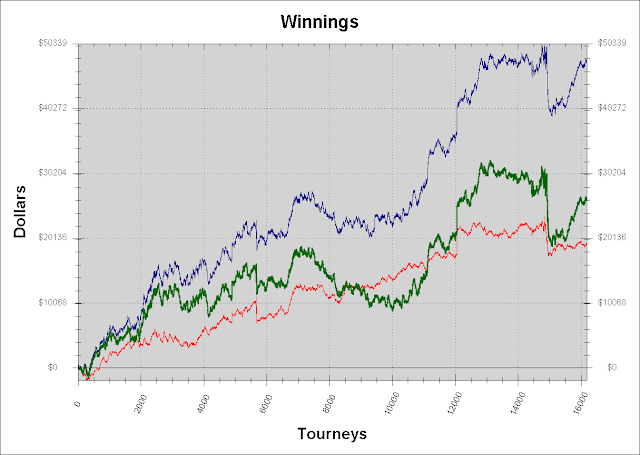 I got ITM at the BOP and the Turbo Takedown, but nothing more. 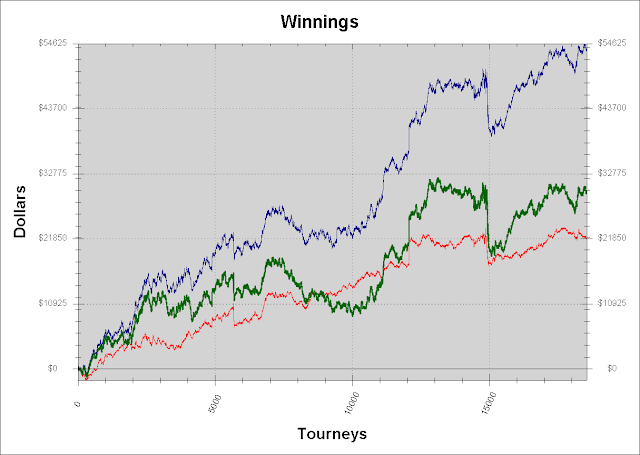 I needed to spend some days without playing poker online and plan what I'm going to do the next months! I also planned to go to Las Vegas. I played day 1D (8th of July), I didn't have any expectations regarding the torunament apart from having a nice time in Las Vegas! Ah, the photos of the room that PokerStars is offering for being Supernova Elite seemed promising! They really give the best to SNE. As stated in the title, I finished the challenge, reaching $60000 of profit that I set as a goal for 60 days. On day 53 I played 6 hours and I had a fantastic run of cards. It was actually quite funny, cause even though I wasn't following the football matches and didn't know what time they started, I could tell when they were starting, when they were over and when they had breaks! When a game was starting I was left with 6-9 tables, at the point of the break everyone was playing hyper-turbos...20 tables, when the break was over, back to 6-9 tables and after the end of the match 20+! I planned to keep playing until the end of June, but it will not count for the challenge, I consider that done. I have already read in blogs of readers that many of them decided to create their own challenges and I'm happy about that. I feel that my blog is really useful and that I'm not just writing for the sake of writing. Apart from motivating readers set their own goals and try to achieve them, I also recommend when you want to buy somehting, like I wanted to buy a new mobile phone, to create a challenge where you have to make more money than what is needed to buy what you want. That way you become richer since you make more than you spend! From now on, I will stop posting the passwords for the Sunday tournament of andrecoimbra.com and I will start sending them to all followers of the blog through my newsletter. If you are already a follower, don't forget to subscribe to the newsletter (it's at the same place where you subscribe as a follower). The idea is that the tournaments become exclusive for the followers of my 2 blogs! On day 51 I didn't play, cause on Mondays I need to recover from Sunday's marathon. I watched The Big Game instead. You can watch the episodes for free! For those who have never heard of the show... any American or Canadian can qualify through free-rolls to be the Loose Cannon. This person plays a Cash game at a table against 5 professionals with $100K from PokerStars. In case of profit, the player keeps it all, and in case of loss it's PokerStars that loses the money. 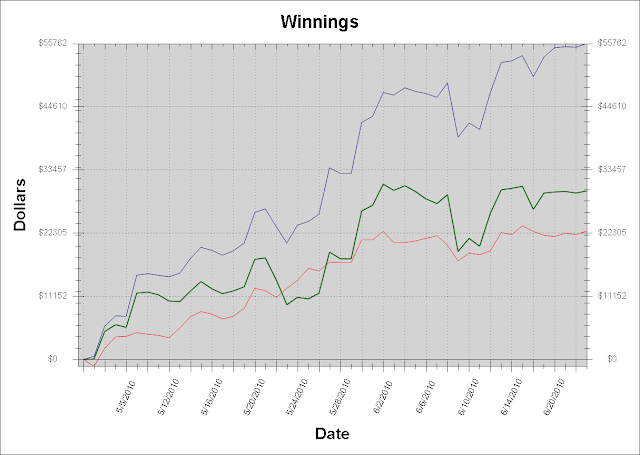 I don't understand Cash games very well, but if I were in the shoes of the 1rst Loose Cannon, I would have played more loose than him and I would have tried to put money on the table on more marginal situations. I would have done that cause the profit is all for the player but the loss is not. I believe he played quite tight, waiting to have "the nuts" and that wasn't a very good strategy cause when he did get a good hand he was giving away that he had one! Have you been following the show? What do you think of it comparing to other shows? On Saturday I didn't play at all, but on Sunday I played 10 hours. I was very boring to play on Sunday, because I wasn't used and I was losing most of the day. I hadn't thought of this before but... losing is very tiring! 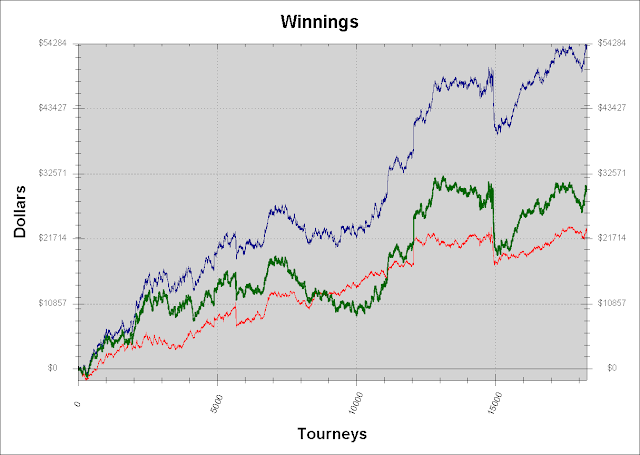 On the other hand, there were some $153 satellites for the mega-satellite of the WSOP, so I played five of those. They were a bit more difficult than the $88 ones and had some regular players of the $220s, but they also had many casual players, so I thought they were quite ev+. 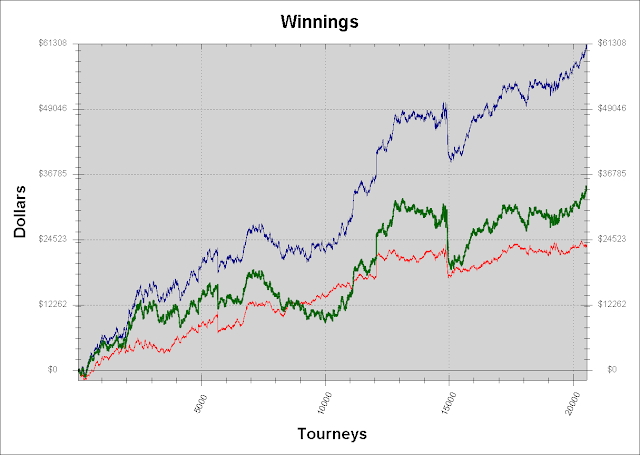 I ended up getting 13.000 VPPs on Sunday! I believe that my blog doesn't have more followers because the readers don't fully understand the advantages of being a follower. I follow some blogs through Google Reader (which is 100% free) and when someone makes a new post I always receive a notification on my Google Reader. In the case of this blog, since there are only 2 posts per page, it's possible that you don't see all of the new posts if you don't frequently visit the page and it often happens that readers don't find the post with the password of the Sunday tournament for example. On day 47 I only played 2 hours just to reach 500k VPPs. I have been playing less the past few days, about half of normal. From time to time I feel the need to spend some days thinking, relaxing, etc, without working many hours. It's a luxury that I allow to myself and I believe it helps me progress in life. In any case, during the 2 weeks that follow I will go back to normal schedule as far as working hours are concerned. On day 38 the temperature was 38 degrees and in the end I reached a point where the heat was stronger than my laziness. I walked 10 minutes to the closest Mediamarkt and I bought a fan. I am quite lazy when it comes to anything that involves me moving, it always has been like that and always will be. On the other hand, I like to think, preferably lying down and with my eyes closed. The majority of people prefer the opposite, they need to be always on the move, they think that "stoping is dying" and they are lazy when it comes to thinking. Being different than the majority is a good or a bad thing? I'm expecting your comments on that! I haven't reached 500k VPPs, but tomorrow I will for sure! Do you recognize that look? I reached 75% of the challenge, so I'm slightlly ahead of pace, which is great, now I need to keep the same rythm and try to finish the challenge on time. I was impressed with "PokerStars.Net The Big Game", the first episode was very good and it gave me the impression that everyone that was present was enjoying it more than at other programs. This made it more interesting and fun to watch. 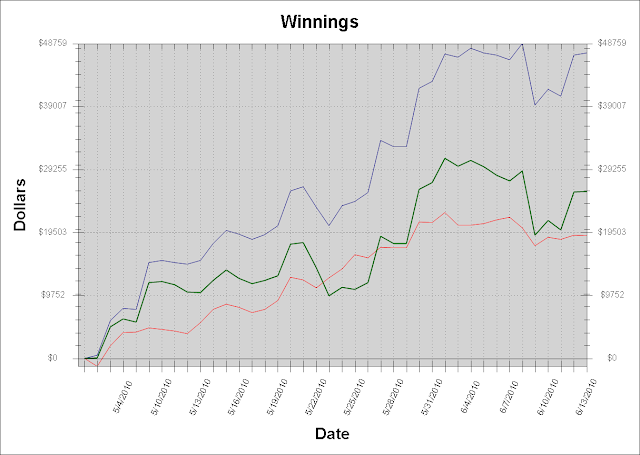 This week, the tournament will start at the same time as the Sunday Million and there will be the usual prizes. PokerStars will give to all players that make it to the final table a ticket for the Sunday 1/4 Million that will be credited to their account during the following week. This tournament will be part of the Summer League. On day 44 I didn't play at all since Monday is usally the day that I recover from the weariness of Sunday. The two following days however, I would have to play a lot and I planned to start playing in the afternoon. I like it a lot to play on Sundays because there are always as many tables as one wants to play and I don't get bored. On day 43 I played a lot of hours, each time it costs me more to play some hours in a row, I think I'm getting old! (we all are, aren't we? 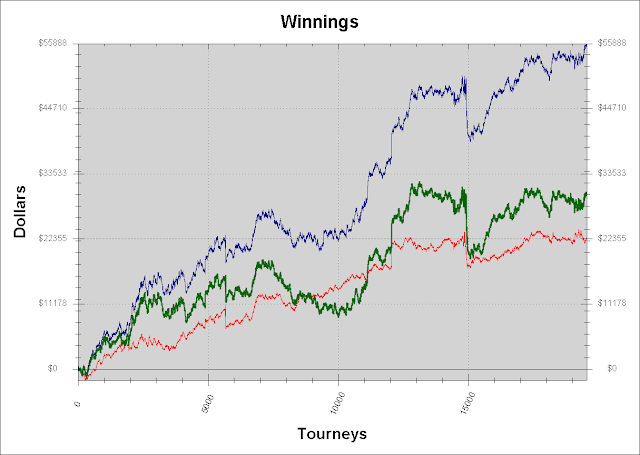 :P) Unfortunately, I didn't make it ITM in any of the mtts that I played but the day went pretty well as far as the satellite hyper-turbos go. P.S. : I have 486.7k VPPs, but I don't worry about VPPs, just about the total profit, which is good. 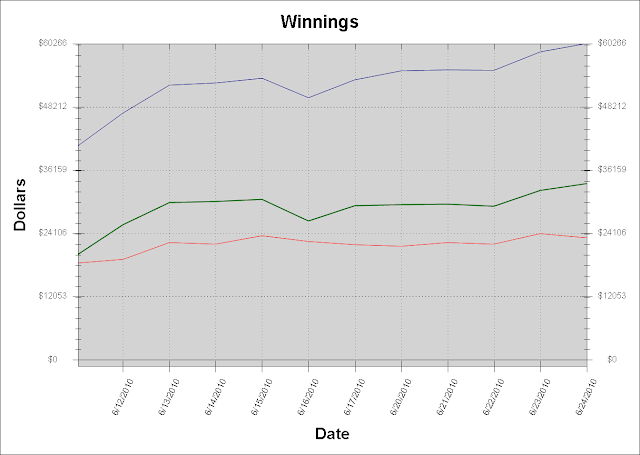 I should finish June with 55%-60% of the points necessary to renew SNE or to be on pace. The hyper-turbo satellites are a bit tiring, but they make my life easier since the points come easily. That day I did 4 sessions of one hour and a half each, with a 30 minutes break after each one, so I played a total of 6 hours. I would like to have played a bit more, but I couldn't do it because of the heat and the fact that I was very tired. It was one of those days where everything goes well and I finished quite positive. The following day was a Sunday, so I would try to play many hyper-turbos! I was also going to play the Sunday Warmup and the tournament of the Summer League of andrecoimbra.com.